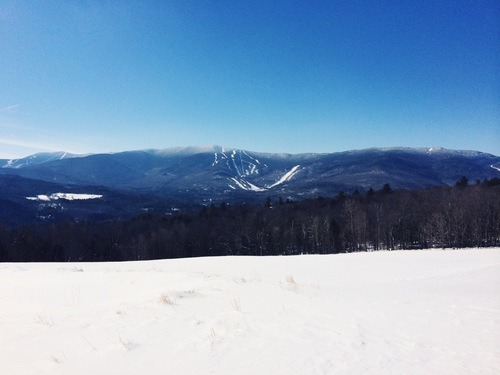 I thought it worth mentioning that we spent last weekend in Vermont! It technically doesn’t have anything to do with running, but Vermont is a very special place to us and we try to head up there as much as possible! This was my first getaway since tearing my ACL over Christmas, and it felt great to change up the scenery a bit! View of Mt. Ellen at Sugarbush Resort. Gary’s family lives in southern Vermont, and some of our closest friends live further north. We went to college in Burlington ourselves, met shortly thereafter, and lived in the area for a couple more years in our early 20s. So last weekend was about catching up with pals in Waitsfield – Gary hitting the ski slopes, and me getting to photograph one of my lovely 2014 wedding couples (yep, I’m a wedding photographer)! Our friend Sarah is one of three sisters, and each of them have torn their right ACL in recent years (hashtag honorarysister)! 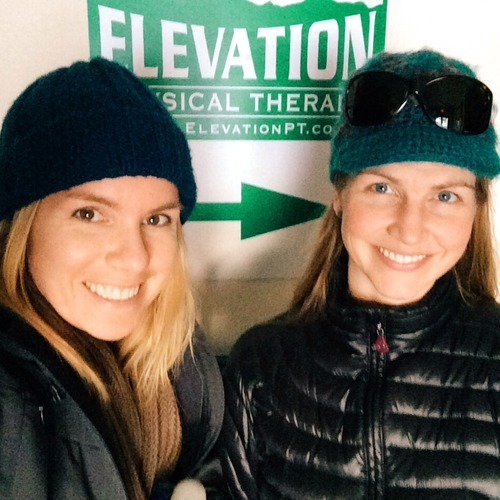 In addition, two of them are physical therapists, and I was psyched to sneak in to Elevation Physical Therapy for a little extra movement on the leg! We also took a “prescribed” hot tub on the back deck before our Sunday evening departure! I was scared as heck to walk out on the slippery deck, but it was worth it to savor some fresh air and sunshine outdoors! Overall, my knee was totally tweaked for the weekend. The drive hurt, and bending felt more miserable than it had been in recovery thus far. But it was a great mental break and I was able to get back in the pool at PT for the first time post-op Monday morning! Where do you tend to get “away” – your happy place away from home? Are you drawn to warmer climates every time? Do you venture out of the city or into the city? Toward the action or toward the calm? We’re always heading north to the mountains, and most often Vermont. We love skiing, hiking, camping, even winter camping in yurts and cabins! New England is an incredible place to be.